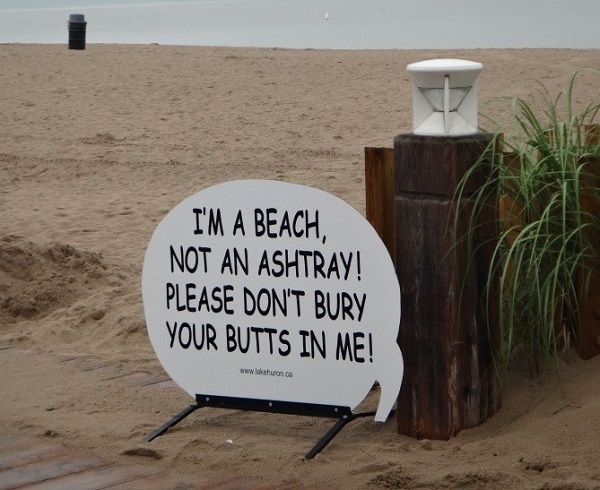 Signs asking smokers to take their butts home with them, along with free portable ash tray dispensers, have been posted on beaches from Sarnia to Sauble Beach this summer. Karen Alexander of the Lake Huron Centre for Coastal Conservation says cigarette butts are one of Canada’s leading litter problem. She explains cigarette filters are made of plastic so they do not bio-degrade. They also contain up to 160 toxic chemicals, of which 60 are know carcinogens. When the cigarette butts get wet those carcinogens leach into the surrounding environment. Alexander says she hopes the signs will encourage people to treat cigarette butts like any other waste and not leave them on the beach. When they do their beach cleanup this fall, Alexander is hoping there will be a significant reduction in the number of cigarette butts they have found in previous years.